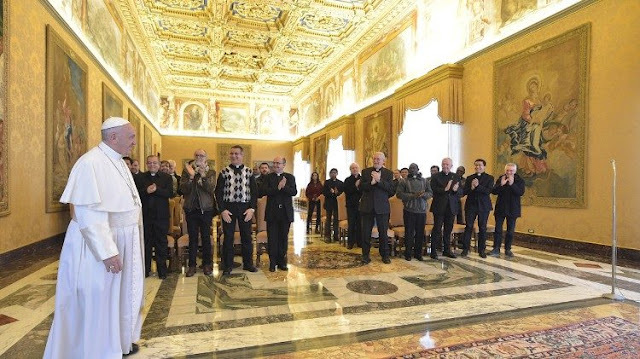 On Saturday, Pope Francis received in audience members of the Congregation of the Sacred Stigmata, or the Stigmatine Fathers, on the occasion of their General Chapter. Fire. This is the image Pope Francis used with the Stigmatine Fathers. “I have come to cast fire on the earth. How I wish it were already ignited!” (Luke 12:49). That fire, he said is God’s love for us. He then invited those participating, to “rekindle within yourselves and your communities the fire of the Word of God.” This was Pope Francis' message in prepared remarks which were delivered to the Stigmatines gathered in the Vatican for the audience with the Holy Father. The written remarks were distributed to the Fathers while the Pope spoke with them off the cuff. The Stigmatine Fathers were founded in Verona, Italy in 1816 by St Gaspar Bertoni. Theirs is a specifically missionary vocation at the service of the Bishops, the proclamation of the Word of God, and the formation of young people and clergy. They are present in 15 countries and number about 400 members. In his prepared text, Pope Francis said, “In the Bible God is compared to fire, but he is the fire of love, which conquers peoples’ hearts not with violence, but respecting each one’s freedom.” He highlighted the way in which their Founder announced the Gospel—humbly and joyfully after the example of Jesus’ own style of evangelizing. It is “through the joy of your life,” Pope Francis said, that “you can lead people to conversion, to communion with Christ.” In fact, it is precisely the “fraternal community of missionaries” that confirms their proclamation of the Gospel because it has been “tested by fire,” he said.